Correspondent was broadcast on Sunday, 30 November, 2003 at 1915 GMT on BBC Two. Mexico City is one of the most crime-ridden cities in the West. The police force is underpaid, unmotivated and inefficient. 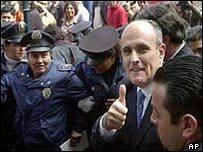 In a desperate bid to cut crime, the Mexican police hired Rudy Giuliani, the former mayor of New York City, to assist them. In New York, Giuliani cut crime rates by over 60% and is famous for inventing "zero tolerance". He and his team of American officers were asked by Mexico City's beleaguered mayor and police chief, with a little help from private investors, to work out how to bring law and order to one of the toughest police beats in the world. 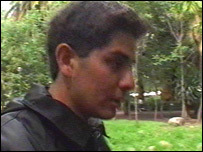 The programme has exclusive access as it follows the Mexican police and Giuliani's American team on their year-long, crimebusting exercise. It is an extraordinary crime-cutting exercise in a city very different from New York. Will Giuliani's fee - $4.3 million plus expenses - be money well spent? Policemen like Fantasma (25) and Pinocho (33) struggle to get by, and even have to pay for police car repairs and their own uniform themselves. Leomar (41), a social worker who lives in Mexico City's La Roma district, is so scared she hardly ever leaves the house. And Arturo (27), exasperated by the police's inability to fight crime, has become a neighbourhood vigilante. Correspondent: Gringo Crimebusters explores whether it is possible to impose the New York model wholesale in Mexico City, and asks whether Giuliani can really make a difference to this beleaguered place.